COLUMBIA, Mo 5/28/14 (Beat Byte) -- Brampton Ln. Scott Blvd. Bellview Dr. 7th St.
Lasalle Place. N. Garth. E. Worley. Lovejoy Dr.
Spring Valley Rd. Pendleton St. Forum Blvd. Chapel Hill. Just a few Columbia streets that reported overflowing sewers and basement backups in 2013. 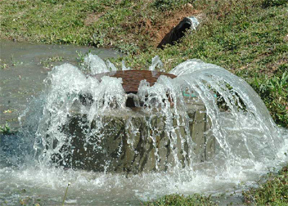 The city's sewer utility keeps an annual list of so-called "sanitary sewer overflows" and "water in basement" incidents, dreaded symptoms of a sewer system that continues failing despite bond issue after bond issue and rate hike after rate hike. Failing infrastructure has become Issue Number One in Columbia, after city leaders used it to push a failed TIF effort, repeatedly telling the public that without the tax incentive, city utilities -- electric, water, fire, police, and sewer -- could support NO MORE DEVELOPMENT, particularly downtown. But the Columbia City Council has done nothing but support more development, right down to fighting a citizen effort -- Repeal 6214 -- pushing back on a six-story student apartment in light of more, higher, and larger apartments yet to come. Although insufficient public notice, hasty hearings, and poor public process have also motivated the repeal effort, city infrastructure so taxed that sewers spill into streets and basements remains a major reason behind widespread resistance to more apartments. "Excessive Infiltration and Inflow," the city's list reads, describing some of the 204 reports between January and June 2013, the year's wettest months, during which rainfall and stormwater "infiltrate" cracks in decrepit sewer pipes, pushing water and sewage where it doesn't belong. Despite the problems, city manager Mike Matthes "tried to discourage the City Council from following the Downtown Leadership Council's recommendation to hire an independent consultant to perform a sewer review," retired Columbia sewer superintendent Bill Weitkemper explained in a May 7 email to Council members and city administrators, about the Council's May 5 regular meeting. Meanwhile, the list of streets with overflowing sewers continues. Ridgefield Rd. Greenbriar Dr. South Garth. Jackson St.
Secretariat. Aldeah. Foxcreek Way. Noble Ct.
"We are really at the point where if we want to see anything developed downtown, we have to see infrastructure improved," Matthes said in December. But now, he's joined the fight against citizens who want to hold him to his word.